Everything we have on the Bingo cars. In trying to get the story together, I am assembling correspondence for review onto page 4 of this feature page. As the story gels, we will polish it off into article form. If you have any old pictures of these cars or other information, we would love to add it to this page. Please send them in to RetroRockets and for pictures, please include a description, if possible. This picture was one of the original posts on RetroRockets: "The Inimitable 151". This Bingo 151 car was driven at the 1967 Sandusky Classic by Johnny Logan. I think Max Dowker built this car and it was also driven by Sam Sessions, Art Bennett, Mort Andresen, and Ken Crampton. In it's early years, the car was owned by Pete Webster, and originally driven by Nelson Ward. At that time the car was Bingo 5. John Gradentski of Vermontville built the engine. 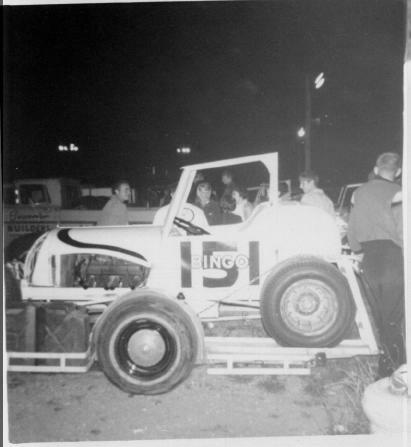 The number was changed to Bingo 151 when Sam Sessions took over the car after Nelson Ward was killed at Owsego. So, I think that Nelson Ward never drove this car (the Webster Bingo 151). He only drove the Gordenski Bingo 5. Johnny Logan, Art Bennett, and Sam Sessions all did drive this car, not sure about Ken Crampton and Mort Andresen. This car was built by the Gordenskis for Pete Webster and Max Dowker did not supply the motor, Johnny Gordenski did, who also supplied the motor for the Jay Gordenski owned Bingo 5, which has been mistakenly identified as the Webster Bingo 5. After viewing this picture in the Harry Jones Feature Page, Jim Liccardi wrote in: "In the process of checking out the new feature on Harry Jones, I discovered something that I never knew, and want to ask you about it. 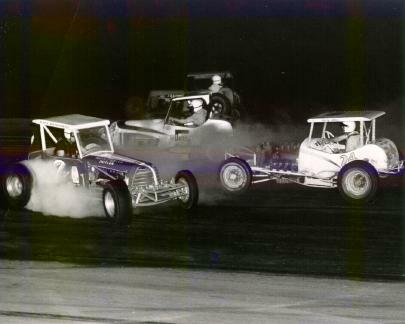 On Pg.8 of the feature, third pic down, (file s32) is a group of cars spinning, dead center is the white car Bingo 5, which looks very much like the Bingo 151 that Sam Sessions drove at Oswego. Is it the same car? Also I can tell by the length of the roll cage that it is not the same car of Nelson Wards Bingo 5. When Ward raced at Oswego, I think Cannonball Gresley, who was Jim Gresley's grandfather, owned the car. And I know that Pete Webster owned Session's car. This is the first time that I have actually seen the Sessions/ Webster car run as Bingo 5. I am almost sure I can remember both cars running the Classic in 62 & 63, and according to the stats for both races, in 62, Ward ran the Bingo 5, and Sessions the Bingo 151. 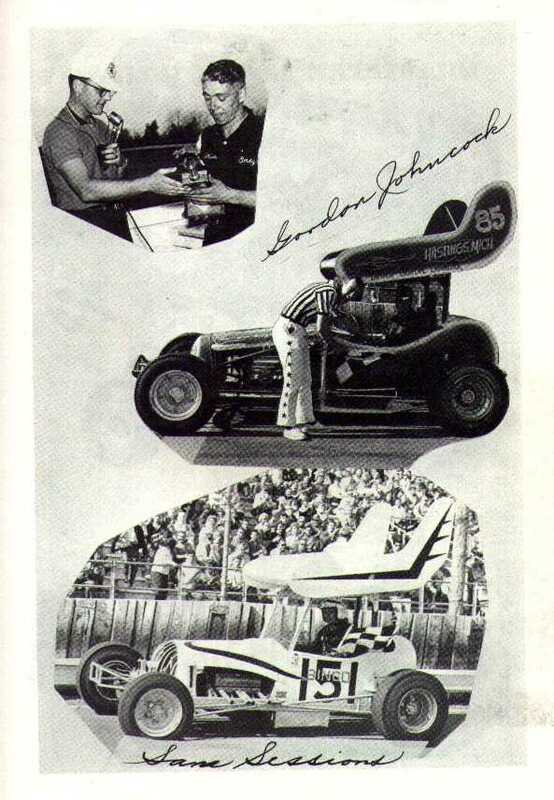 In 63, on Aug. 23rd Nelson was killed at Shangri-La Speedway in Owego, NY, so Johnny Logan was in the Bingo 5 carfor the Classic, while again Sammy was in the Bingo 151. I have seen it mentioned in your site, but I am ashamed to say that I thought who ever captioned the picture was mixed up with the 2 cars. Can you give me more of a history or time frame between the two cars. this picture really amazed me." Still not sure if this Bingo 5 is the same car as the Bingo 151, but whether they are the same car or not, both (or "it") was built by Pete Webster. We need Tamara Webster to find this out for us. This picture is from Volume 23 of the photo archive: From "Who's Who in Racing", 1963. Supermodifieds. 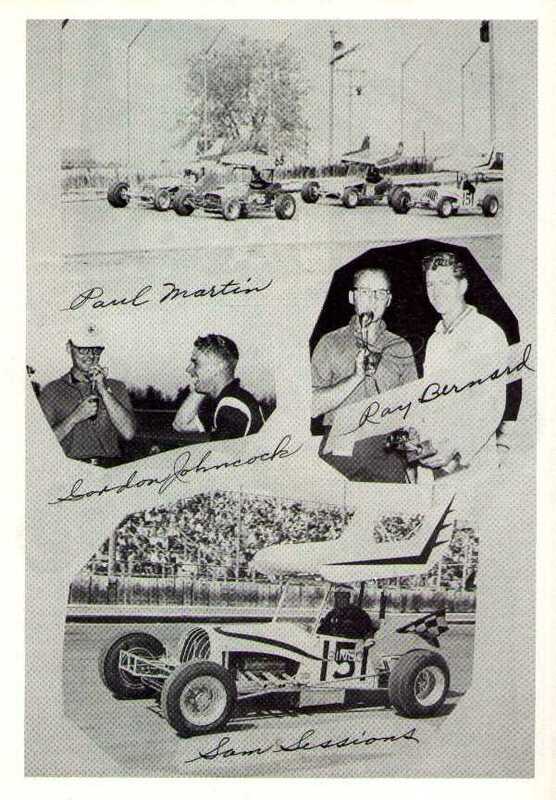 Paul Martin, Gordon Johncock, Ray Bernard, Sam Sessions in the Bingo 151. This picture is from Volume 24 of the photo archive: From "Who's Who in Racing", 1963. Supermodifieds. Gordon Johncock in the #85. Sam Sessions in the Bingo 151.